It’s that time of the year again. Mornings are crisp. Days are cool. The leaves are changing. It’s the perfect time of year for running. And we now have fewer than 12 hours of sunlight and are getting less every day. 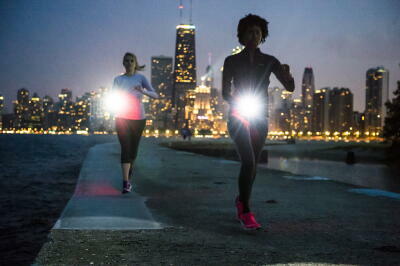 For many morning and evening runners, this means you are probably running in the dark or will be pretty soon. Are you wearing anything reflective? A lot of us think just throwing on a bright orange hat or neon yellow shirt is all we really need to do to be visible at night, but it actually takes a little bit more than that. A reflective vest or jacket vastly increases your range of visibility by passing cars, giving drivers more time to react to you being on the road. What lights do you have? Besides just having a reflective vest or jacket, it is a good idea to have one or two other lights somewhere on you as well. For example, I wear a reflective jacket with one light that wraps around my arm and another small light clipped onto the back of a hat or jacket with one or both of those lights strobing. I like the light on my arm because it moves with my arm, creating more of a visual cue for oncoming traffic, while the light clipped on my back shows my location to traffic coming from behind. How are you going to see? Unless you can complete your run in an area lit entirely by street lamps, there’s a good chance you will have places on your run when you will need a light in order to see. Headlamps tend to be the most popular solution. Wherever you look, there will be light! Just be careful not to blind any oncoming traffic. If the idea of having something on your head bouncing along with you doesn’t appeal to you, there are also handheld flashlights with straps on the back so you don’t have to worry about dropping them. Most of us hate thinking about it, but what is your plan if you are hit by a car and need to be taken to the hospital? How will the paramedics identify you and know who to contact if you are unconscious for any reason? Having a form of identification on you while running in the dark or even in the daylight is a must. You can do everything right and still wake up in the hospital unexpectedly. Running in the dark makes us think about safety a little more, but that doesn’t mean it has to be dangerous. If you have the proper gear and take the necessary precautions, you can focus more on the miles and make it home for some warm apple cider.